The success of the tunnelling or mining work depends not only on the selection of the most suitable boring machine, but also on the most efficient system to evacuate the spoil to the surface. Interruption in the evacuation works very often leads to the interruption of the boring availability and subsequently, to stop the overall production. 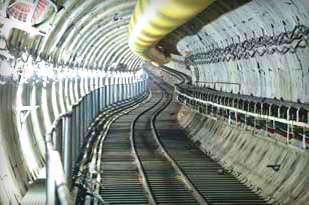 TERRATEC has designed and built sophisticated continuous conveyor systems specifically for individual tunnel and TBM conditions. These systems include Continuously Advancing Conveyor Systems in the tunnel, transfer systems, vertical conveyors and stacker systems at the tunnel portal. Especially when tunnels are long, when slopes are steep or when the space for unloading spoil is limited in the tunnel portal, the usage of a Conveyor System has innumerable advantages over evacuation by Muck Cars in terms of productivity, safety and operation and maintenance costs. For mining applications or tunnelling by conventional methods, TERRATEC's Bunker Conveyor is the perfect solution to evacuate the muck due to its robust, simple and reliable design. 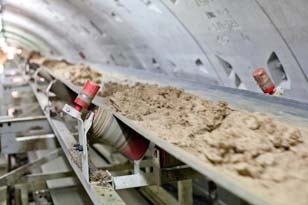 The TERRATEC Bunker Conveyor is designed to be pulled along a monorail as the tunnel advances. It is equipped with a telescopic hopper which facilitates the load of the muck into the conveying system. 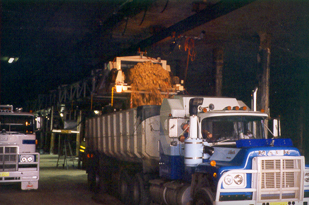 The filling of each truck is radio controlled by the operator so the exact amount of muck is loaded every time.